Timely, objective, high-quality research is the foundation for all of Baird’s equity offerings. And we take our commitment to providing these invaluable insights very seriously. 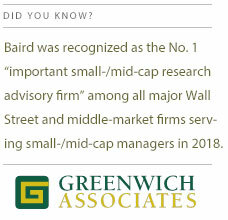 Baird’s dedicated analysts provide comprehensive, award-winning coverage of more than 700 stocks. Our equity research is complemented by macro research and insights offered through our independent affiliate Strategas, a global institutional brokerage and advisory firm. Baird’s financial strength and stability let us commit to continued coverage for the clients who rely on us, while our employee-owned and independent structure enables us to focus on growing in the sectors where they want and need our perspective.